Another month has gone by – time once again for my Secret Recipe Club post! This month’s assignment was a great blog called Kitchen Trial & Error. Kate’s recipes were a lot of fun to browse, and I found myself having a hard time choosing between several. I came very close to baking these delicious bars but instead, opted for a healthy side dish to have with fish for dinner. I made this very early in the month and since then, we’ve had quinoa three more times. It’s becoming a favorite in this house! This dish couldn’t be any easier. It’s a great substitute for the usual rice. Full of protein and fiber, yet nice and light – perfect for summer! 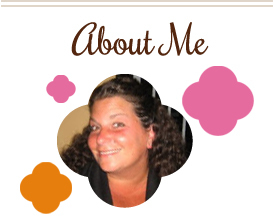 Check out Kate’s blog for some great recipes…there are certainly plenty to choose from! Heat stock to a boil and keep warm. Meanwhile, heat butter in a saucepan over medium low heat. Add onion and saute until soft, about 3-4 minutes. Rinse and drain quinoa, then add to saucepan with onion and stir until toasted, about 3 minutes. Stir in stock and season with salt. Turn heat to low, cover and cook for about 17 minutes. Fluff with a fork before serving. Top with chopped scallions, if desired. This entry was posted in QuickAndEasy, quinoa, Secret Recipe Club, side dishes. Bookmark the permalink. Love Kate’s blog. 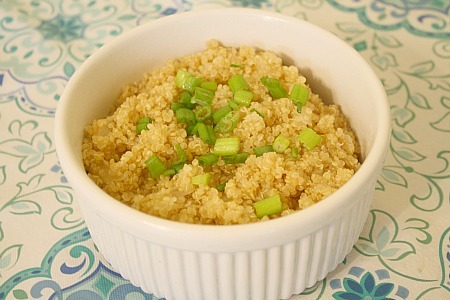 This quinoa looks simple and delicious! Book marking. Yum, yum, yum!! I love Quinoa – great pick for SRC! Sounds like a great summer side dish! If you haven’t already, I’d love it if you’d check out my SRC pick this month: Dark Chocolate S’mores Pie! What a great alternative for rice pilaf, looks wonderful. If you haven’t already, I’d love for you to check out my SRC entry Candied Popcorn. This is truly gorgeous. It just looks so fresh and light. Plus it’s pretty which I totally appreciate. I love how simple food that is healthy can be so delicious! 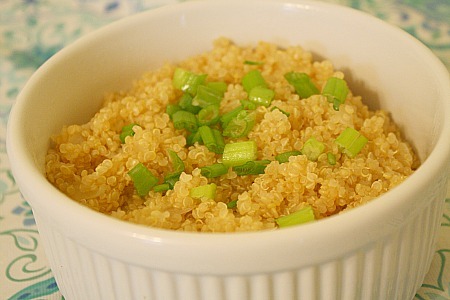 What a great alternative to rice pilaf, quinoa adds more nutrition. Love it! Great photo, too. So few ingredients, yet such a lovely, fluffy main or side dish. I have yet to try quinoa, but this would be one of the great places to start! Fantastic choice from Kate’s blog! I have yet to try quinoa, but I have no idea why. This looks like a great “intro” recipe, and I’ll definitely have to try it!